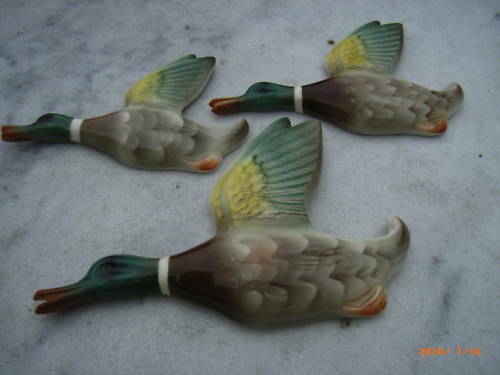 I am so pleased to announce that I have finally obtained some vintage flying ducks. I'd kind of given up hope. They should arrive in a few days. I'll take a pic of them when they're up on my wall. Oh wow, I remember you blogged about that a long time ago! Congrats! I hope you didn't pay much for them, they usually cost over $100 over here for some old authentic ones. No, Amy I didn't pay too much for them. That was the problem - they were going for silly money but we refused to pay over a certain price. We had decided that's what they were worth and stuck to it. I have a suspicion a lot of retro/vintage shops are buying them up for stock. Three women die together in an accident and go to heaven. When they get there, St. Peter says, "We only have one rule here in heaven...don't step on the ducks." Along comes St. Peter with the ugliest man she ever saw. St. Peter chains them together and says "Your punishment for stepping on a duck is to spend eternity chained to this ugly man!" The next day, the second woman steps accidentally on a duck, and along comes St. Peter, who doesn't miss a thing, and with him is another extremely ugly man. He chains them together with the same admonishment as for the first woman. She manages to go months without stepping on any ducks, but one day St. Peter comes up to her with the most handsome man she has ever laid eyes on. Very tall, long eyelashes, muscular, and thin. St. Peter chains them together without saying a word. The woman remarks, "I wonder what I did to deserve being chained to you for all of eternity?" The guy says, "I don't know about you, but I stepped on a duck!"